← I Have Fallen In The Rabbit Hole! Am I the only one who loves to watch movies like Chitty Chitty Bang Bang (CCBB) and My Fair Lady while stitching? I love these classics! Although, I wish Netflix would stream more Fred Astaire. Also, people seem to think that the 2+ hour “epic” movie is a new thing. It is not. Anyway, while I was watching the 2 1/2 hour CCBB movie, I worked on (and completed) the first panel of the second dress. Here are the results. The smocking for this whole order is not quite halfway done, but I’m getting close. 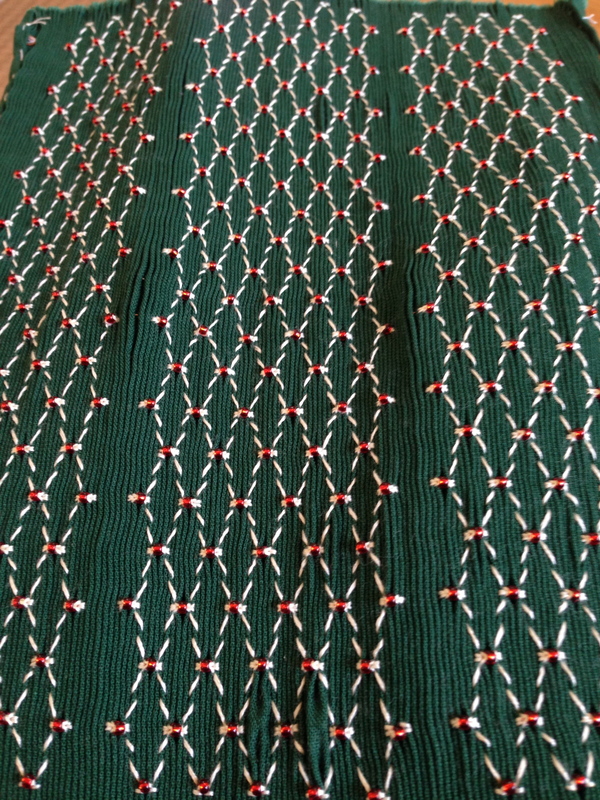 I figured out that the green beaded panel took 24 hours of stitching (that is total stitching time). So, that one took about 4-5 days to complete. This red beaded one took 2-3 days. So, for these two dresses, I am looking at another 7-10 days of smocking time. Then I have to smock the bishop dress. Whew, every year I say I am not going to do this order again, and every year I do it anyway. Next year, somebody stop me, please!! Totally unrelated topic…our Saturn. Unfortunately, our Saturn was parked in the wrong place at the wrong time and Scott backed into it with his mother’s (huge) truck. He did not see the Saturn, since it sits so bloody low to the ground, but the thud and noise was unmistakable. 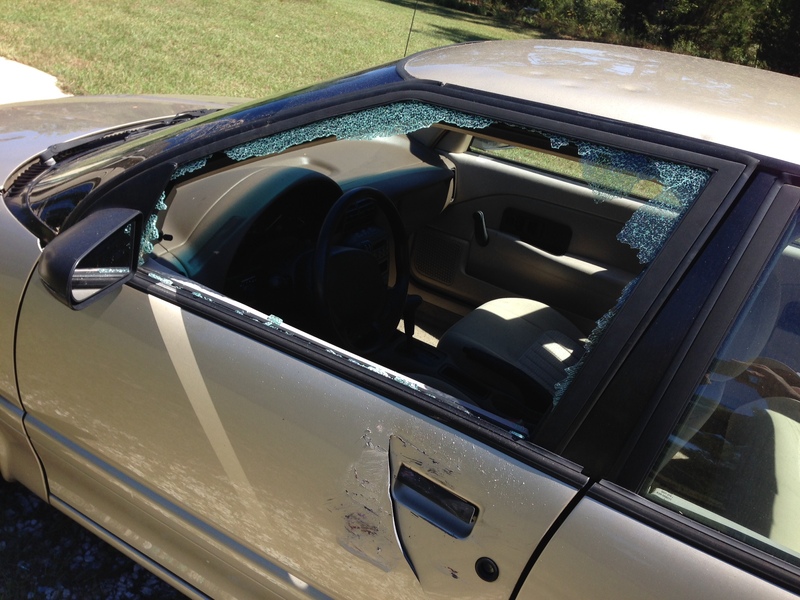 The driver side door will not open now and the window shattered. No one was hurt. Here are the before and after shots. Giggle if you must, but it beats walking from Beauregard to Auburn! 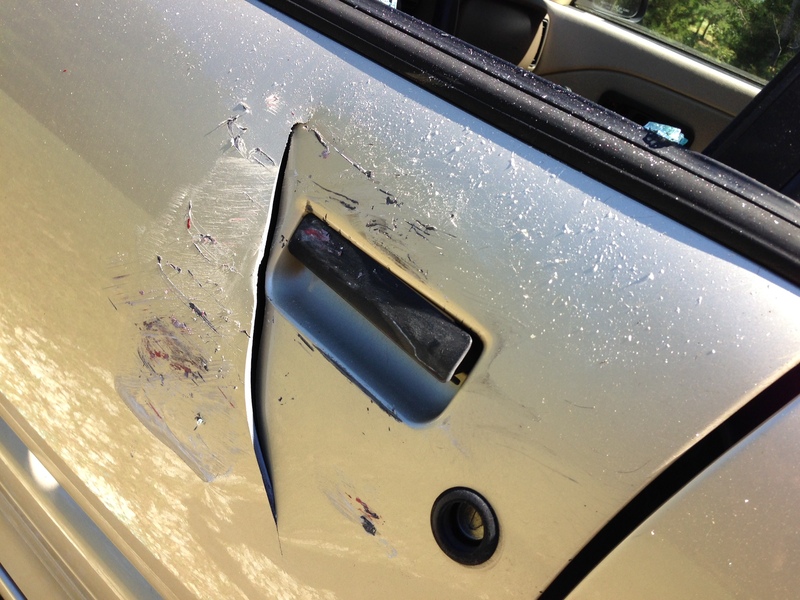 See if there’s isn’t a junk yard (or a U Pull & Pay) for a replacement door. 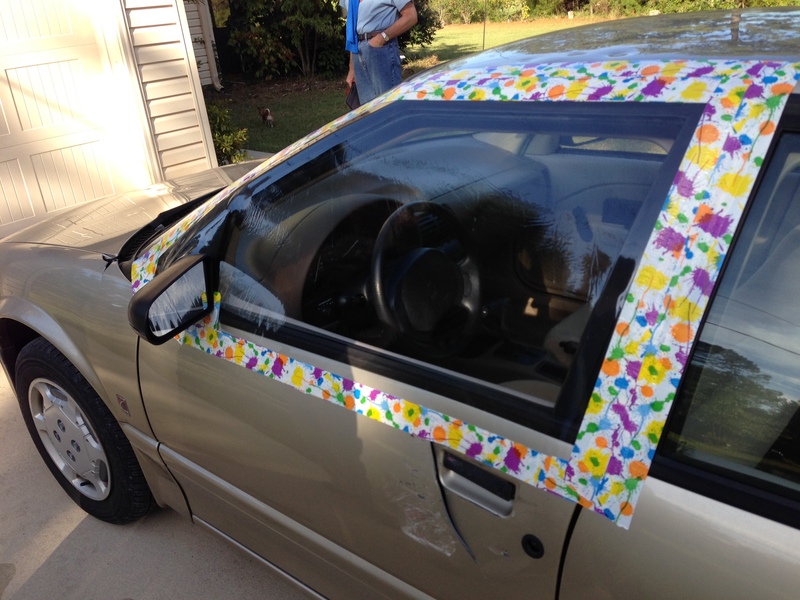 Taking the panel apart shouldn’t be too difficult, and it beats turning it in for a hit against your car insurance.